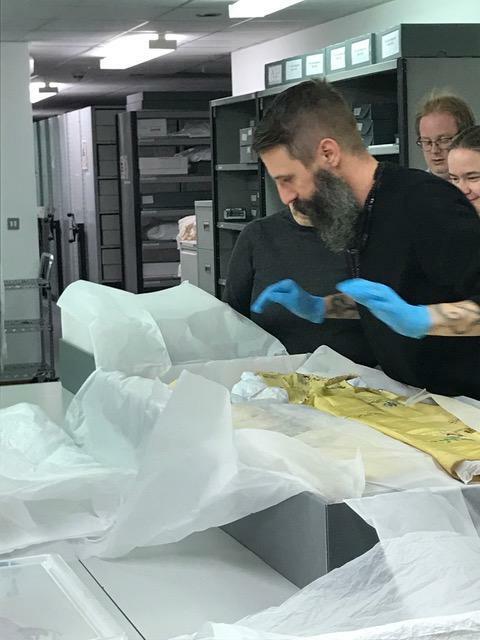 On the 17th of April 2018, the Samuel Johnson Reading Circle went behind the scenes with the Museum of London’s curator of fashion, Timothy Long. Having filed in and shown security several copies of the same book (we’re all reading The Age of Wonder in readiness for the next session) failed an initiation test involving blank metal coins and lockers – eventually we were sorted into some sort of order, ushered to the bowels of the museum and through all the signs not permitting us to enter- always a thrill. The Fashion and Textiles department itself reminded me of secondary school technology classrooms; with high benches and high stools, rooms lined with bookcases containing box-files marked ‘Fashion 1984’ and ‘Youth Tribes 91-94’. There were partial mannequins dotted about and a piece of metal I recognised which had once served the place of a grand lady’s wig. It was explained to us that the Museum of London had just finished a relatively major reshuffle of their sight/sound presentation of Vauxhall Gardens. 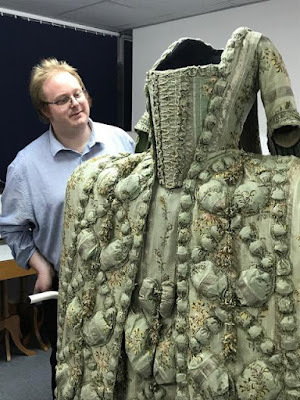 A 15 minute show, with access to seating and changes in lighting, it was originally designated as a way of breaking up museum-fatigue and show off some of their extensive eighteenth century fashion collection. The previous pieces having been shown off for over five years, it was time to take the strain from them and give other outfits a chance to shine. We were shown some of those items before they were put to bed for a while. The first was a relatively simple dress, with red and white stripes and little bushels of wheat embroidered on. Timothy explained how, in designing the Vauxhall Gardens exhibit, the team had created ideas of characters. This character was a relatively poor person who had saved up to go to the pleasure gardens and having spent a day there was preparing to leave before the richer, rowdier set arrived. The dress had been altered a number of times, as had almost all the dresses in the collection. Dresses were even cut to leave room for alteration as the dress was worn for different occasions and passed on to different people. 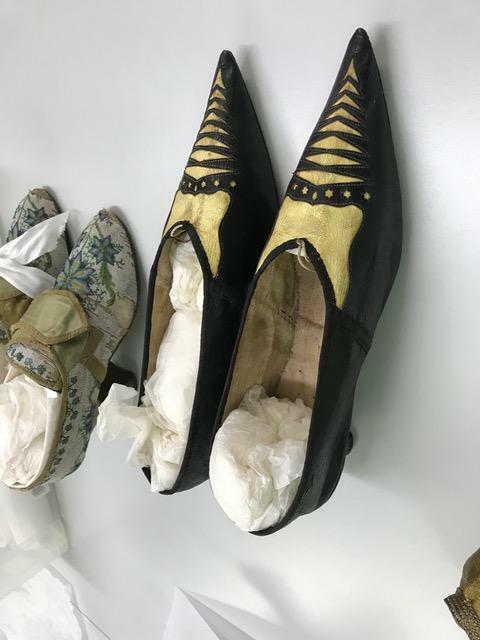 There are two broad approaches to keeping and displaying fashion and textiles. One is to focus on the fashion/art element of the piece, in which the item displayed is altered to bring it back as close to it was originally. The other is the historical approach, where all the alterations and even the dirt tells a story. We were told about a flapper dress that had a huge stain on it - which was left on the dress because it came from the original wearer smudging it when fixing her new car - an oil smudge as a sign of independence. We were shown a man’s suit in a shiny green colour with cream cuffs and cream sleeves. These cream parts were heavily (and brightly) decorated in flowers and peacock feathers. We were asked to describe who the wearer might have been. We thought they may have been rich, perhaps someone who’s wealth came from the East India Company (hence the peacocks) and obviously someone who doesn’t mind showing of a little. All of which could have been right, but not necessarily. 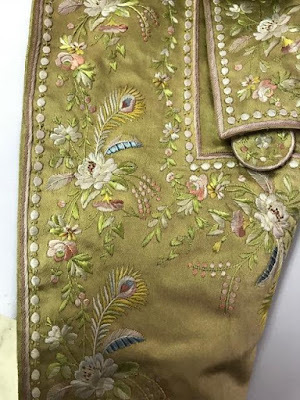 The lack of tailoring (shaping of the cloth to alter shape) and the way the embroidery occasionally went under the buttons showed it to be something of a kit. An expensive kit nonetheless, but still a broadly off-the-shelf look. The last piece was a very striking court dress in a deep green. It was threaded throughout with silver cloth and had puffy bulbs at the front and clusters of metal and silk slivers in little pom-poms. Almost square at the bottom, triangular at the top and presenting bosoms front and centre, it would have been a very striking outfit. Peering underneath (because how couldn’t you?) the dress was structured with about four rigid frames, leaving the bottom half to be rather free underneath, even if the top was all squeezed and pulled about. - Oh, and the deep green colour. 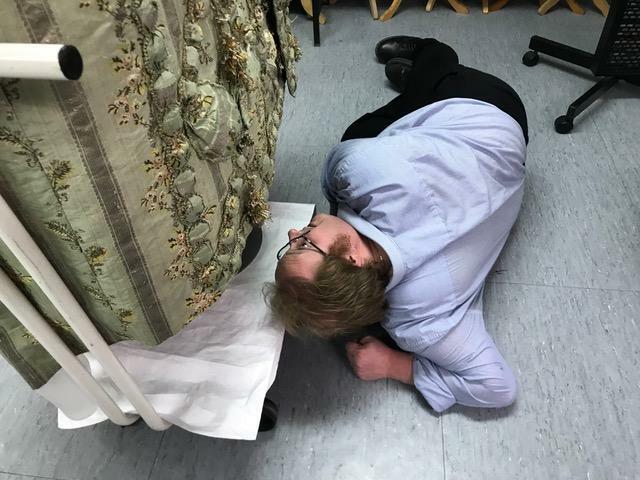 Although awaiting tests, it is very possible that the dress was dyed with an arsenic based dye called Scheele’s Green, which could cause a person to foam green at the eyes, ears and mouth before dying. Alison Matthews David has written a book about such things called Fashion Victims, containing more deadly clothing. Finally, we learned about displaying fashion pieces. The most common way is invisible display, in which a piece is placed on a mannequin without a head or any accessories. Often, these mannequins need to be radically altered to fit the body shape expectations of the time. This is the cheaper, easier method of display; accessories don’t need to be created or found, there is no problem with strange head shapes on mannequins or the expense of wigs and hats. However, the Vauxhall Gardens exhibit took this harder path, for which Timothy Long turned to the public and crowdfunded by £13,000. The Johnson Reading Circle had a wonderful time peeping behind the scenes of one of London’s best museums and it was a lovely bonus meet-up, one which of course lingered with pizza and wine. If you wish to follow Timothy Long and his work at the Museum of London, his twitter handle is @Fashion_Curator . He’s a man who obviously loves what he does and was very good company. -And the photos were thanks to Dr Jane Darcy, 'cos I never have a camera.